Adam Thompson has his finger on the pulse of the Philadelphia Phillies. Bryce Harper returned to D.C. on Tuesday night as the Philadelphia Phillies took on the Washington Nationals and was welcomed by a chorus of boos at Nationals Park. 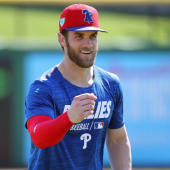 He'd go on to hit a long home run complete with an epic bat flip en route to a Phillies win, and he'll be back at it again on Wednesday when the Phillies and Nationals lock horns for the second game of the three-game series. First pitch is at 1:05 p.m. ET and Phillies starter Aaron Nola will take on Nationals starter Anibal Sanchez. Philadelphia is the -150 favorite on the Phillies vs. Nationals money line and the over-under total for runs scored is listed at eight in the latest Phillies vs. Nationals odds. But before you make your MLB predictions for Wednesday, be sure to check out the Phillies vs. Nationals picks from SportsLine's top MLB handicapper, Adam Thompson. Thompson raked in the winnings as SportsLine's top MLB handicapper last year, hitting on 61 percent of his money line picks for a massive profit of $4,062 to $100 players. Late last season and carrying into this year, he had a streak that included hitting every World Series game and nailing the Mariners' win over the Athletics in the 2019 opener in Japan. Thompson is also on an astonishing 16-4 run picking games involving the Phillies. Anyone who has followed him is way, way up. Now, he's locked in his Nationals vs. Phillies picks for Wednesday. You can only see them at SportsLine. Thompson knows that Harper is off to a blistering start on the season and has been the catalyst for an offense that has produced 31 runs during a 4-0 start. Harper is slashing a robust .429/.556/1.214 through four games with three home runs and five RBI after last night's two-run bomb. When you have a player like Harper who is on a mission to prove he was worth every penny of his $330 million against his former team, it's hard to bet against the motivated superstar. It also doesn't hurt that Harper has Maikel Franco, Andrew McCutchen and Rhys Hoskins in the lineup with him. All four of those players have an OPS of at least 1.016 so far. On the other side, Sanchez is coming off an impressive year with the Braves and gives the Nationals a chance to provide value on the Phillies vs. Nationals money line. Sanchez had a 2.83 ERA in 2018 in Atlanta while striking out 135 in 136.2 innings. In two starts against the Phillies, he had a 0.82 ERA over 11 innings with eight strikeouts. Phillies hitters had an abysmal .533 OPS against Sanchez in 2018. Adding a cutter was the genesis of improved play from Sanchez. If he can continue relying on that pitch, leaning on his change-up, and avoiding the flat fastball that got him in trouble previously in his career, he could have plenty of success again in 2019. Thompson has studied Phillies vs. Nationals from every angle. We can tell you he's leaning over, but he's also unearthed a hidden X-factor you're not even thinking about that determines which side of the money line has the value. He's only sharing what it is, and who to back, at SportsLine. So who wins Nationals vs. Phillies? And what hidden x-factor makes one side a must-back? Visit SportsLine now to find out which side of the Nationals vs. Phillies money line to jump on now, all from the expert who hit 61 percent of his MLB money line picks in 2018 for a profit of more than $4,000 to $100 bettors.